Bob Sheridan wrote in May 2013 about his Brentford families: Payne, Christmas and Grant. As well as providing details of the lineage of each family, Bob has researched places where they lived in Chiswick and Brentford and where they may have worked, including the Pier House Laundry and Palm Toffee Factory. Memories of individuals from WW2 are also included. 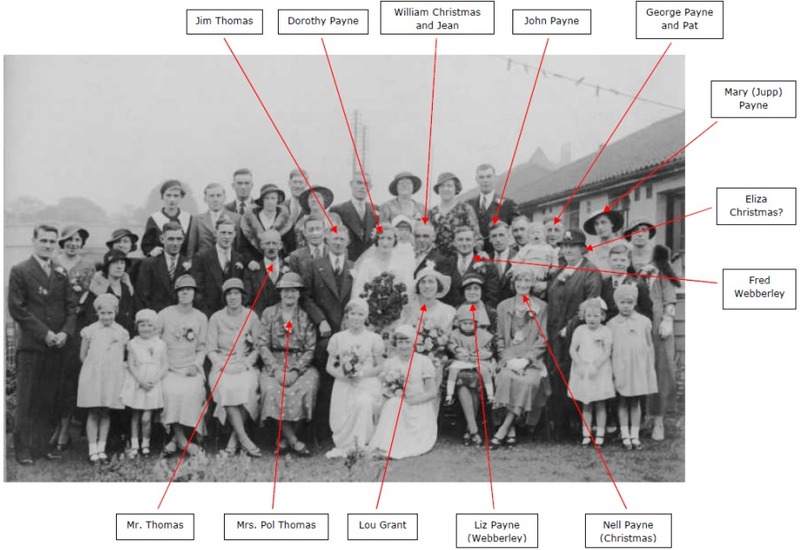 Bob added: I have also included a photograph of Dorothy Payne's wedding to Jim Thomas in 1934. I think it was taken at Burford Road Brentford. It is interesting as it shows members of Payne, Grant and Christmas all together. Mary could identify some of them but it would be interesting to see if we can name some of the others. Please get in touch if you can provide any names. Lyn's mother was born Millicent Mary Jupp. Mary met her future husband, George Noel Payne, when he used to deliver to Higgs, fruiters and florists, on Sandycombe Road, where she worked. At that time she was living with her mother and stepfather, Emily and Alfred, at 31 Sandycombe Road. The land at the back, between the house and the railway line, was owned by William Hickey and Sons, the boiler makers. During the war one of the empty boilers was used an air raid shelter and night one of the Ikin brothers borrowed his father's first world war German helmet and frightened them half to death pretending the Germans had landed. This was not the only war time experience as a land mine landed in the yard and failed to explode. It was actually a failed British mine that had a new fuse inserted and was dropped back over London. It was defused by a Royal Navy bomb disposal crew at great personal risk. A collection was made for the crew which they declined to accept and the money went to the Spitfire appeal. Albert Hickey presented them with a gold watch each. John Ikin, one of three brothers who all worked as riveters for Hickey's, married Dorothy, Mary's step sister, and lived at 13 Sandycombe Road. Mary remembers her house, at number 31 Sandycombe Road, as having three bedrooms and no bathroom. It must have been a tight squeeze with Mary, her mother, step father, three step-brothers (Alfred, Robert and Peter) and four step-sisters Dorothy, Jean, Evelyn and Helen).Mary and George married at The Barn Church, North Sheen. The marriage was a quiet affair as George had recently lost his mother. They first lived at Burford Road, Brentford with George's brother John and then at High Road, Chiswick. When the house in High Road was bombed during the war the family moved to Leicestershire. Mary's eldest daughter, Patricia, had already been evacuated to live with Mrs. Wright at Frisby, near Melton Mowbray. Mary and the two boys, Terry and Alan, were then evacuated to Frisby where they lived with Miss Black and her maid Edith Cross. Years later Edith was living in Catherine Dalley Residential Care Home, Melton Mowbray where, coincidentally, Terry's daughter, Karen, was working. From Frisby the family moved to a cottage at Harby in the Vale of Belvoir, where a third son, Keith, was born. So that Patricia could join them the family then moved to Scalford, a village near Melton Mowbray. It was here that three more girls were born, Carol, Angela and Lynda. At this time George was working away for much of the time constructing airfield runways as part of the war work. He worked all over the country from Portsmouth in the South to Scapa Flow, the Shetland Islands and the Lofoten Islands. Mary remembers him saying he saw HMS Hood sail from Scapa Flow. George was born at 8 Pier Place, Chiswick on 25th December 1910 to William Alfred Payne and Bridget Payne (formerly Hemmings). The birth was registered 3rd February 1911. George was the youngest of six children. He had four sisters, Elizabeth, Ellen, Dorothy and Ada, and a brother, John. William and Bridget were married on 3rd June 1894 at St. Michael and All Angels, Bedford Park, Chiswick. Before her marriage, according to the 1891 census, Bridget was living with Charles and Mary Newell at 43 Devonshire Street and her occupation was described as "Laundry Girl". She is recorded as a "niece" but quite what the connection was is not clear as Mary Ann Newell's maiden name was Watts. William was living with his father and mother, John and Caroline Payne, at 20 Bond Street. He was 16 at the time and no occupation was recorded. Mary Newell's occupation in 1891 was as a "Laundry Hand". John Payne, William's father was occupied as a "Labourer in Laundry". Many of the family had connections with the laundry which was believed to be Pier House Laundry. "A laundry was opened by a French immigrant, Camille Simon, on the river's edge at the west end of Strand-on-the-Green in 1860, moving to the north side of Thames Road in 1905 and 1914. As Pier House Laundry it became one of the largest in London, managed by the Simon family, with 200 employees before the introduction of automation and 19 collection shops at the time of its closure in 1973. The premises, covering 1� a., were then sold and in 1980 were being cleared for new offices and craft industries, although the brick fa�ade of the main building was preserved." From: 'Chiswick: Economic history', A History of the County of Middlesex: Volume 7: Acton, Chiswick, Ealing and Brentford, West Twyford, Willesden (1982), pp. 78-86. URL: http://www.britishhistory. ac.uk/report.aspx?compid=22563. In February 2015 John Jarvis, added 'George ASHFIELD married a Henriette Simon, daughter of Camille Simon, and by 1911 had moved to Bournemouth'. (See Sandra Graves' photo of some Pier House Laundry workers). William was living with John and John's wife, Caroline, at 20 Bond Street, Chiswick. William was the eldest and had five sisters, Caroline 13, Henrietta 11, Mary A. 9, Rosina 4 and Amy Jessie 2. (Two brothers, Harry and John, were to follow later). By 1901 William and Bridget had moved into 19 Bond Street and the first two of George's sisters were born. Elizabeth was 12 years old and Ellen had only just been born. By 1911 the family had moved to 8 Pier Place, Strand on the Green, Chiswick. John aged 9 had been born, also Dorothy aged 7, Ada, aged 6 and George was just 3 months old. From the census it appears that Bridget had four more children who did not survive. Sandra Graves, John's daughter, has managed to find one of them, William Alfred Payne, who was born in early 1895 and died within a few months. So far the others remain a mystery. The family occupations were still connected with the laundry. William is listed as "house keeper" but corrections have been added as "Laundry" "worker". Bridget is listed as "Laundress at home" and eldest daughter Elizabeth as "Packer and Sorter" at "Pier House Laundry". Pier Place was demolished in 1912 and the family moved to Thames Bank House, Goat Wharf (formerly Thames Bank Wharf), Brentford. "William worked for "Clements and Knowling" and that the house went with the job. William was in charge of the horses and lorries. They had a lot of Foden steam lorries and George had to get up early to light all the boilers to get steam up before they could start work. Later they moved on to Napier lorries. They did a lot of work for Great Western." Kelly's Ealing, Hanwell, Brentford & Southall Directory, 1914 has an entry "Clements, Knowling & Co. Limited, tug owners, Thames Bank House, Goat wharf, B. & contractors, Netley road west, O.B." James Clements was born in 1862. He was first a publican and then a lighter owner. He was the Clements of Clements Knowling and Clements Tough. He lived in Thames Bank House in 1915 and was living at "Caeleon", Boston Road in 1919. He was the Charter Mayor for Brentford & Chiswick in 1932 and died in 1934. The following information about the family has been written with the help of Sandra Graves. Elizabeth Caroline (Carrie) was born 8th February 1897 and baptised 28th February 1987 at St. Michael and All Angels, Bedford Park, Chiswick. Mary remembers "Elizabeth working in a toffee factory at Brentford End and there was a school for barge children there. They used to give broken bits of toffee to the kids but one day the foreman was there and they couldn't give them any so they threw horse manure through the windows all over the setting toffee!" She thinks it was the Palm Toffee factory. She also remembers Elizabeth working as a charge hand at the Osram light factory and living at Mafeking Avenue. Elizabeth married Frederick Webberley in 1924 (see England and Wales, Marriage Index: 1916-2005 Brentford Vol. 3a Page 329). They later lived in Greet Road, Brentford and had two daughters, Doreen and Beryl. Elizabeth died in Hounslow early 1971 (see England and Wales, Death Index: 1916-2005 Hounslow Vol. 5c Page 1421). Mary thinks William was a tugboat captain and worked for "Hope Lighterage" and them living in Braemar Road, near the football ground. Kelly's directory of Middlesex 1890 lists "Hope Lighterage Co. Limited (Richard Rapkin, manager), Thames Bank wharf, High street". Kelly's Ealing, Hanwell, Brentford & Southall Directory, 1914 has an entry "Hope Lighterage Co. Limited (James Stout, manager) Goat wharf B." At the time of the 1901 census William was living with his parents at 24 Cressage Road. Benjamin was 42 and worked as a "Barge Lighterman", Eliza was 39. They had four daughters, Harriett 12, Julia 10, Mary 8, Eliza 6 and two sons Benjamin 1 and William who was 3 months old. Ellen and William lived in Greet Road They had three children Jean, Eric and Bill. Ellen died early 1983 in Hounslow (see England and Wales, Death Index: 1916-2005 Hounslow Vol. 13 Page 1614). William died in early 1967 at the age of 66 (see England and Wales, Death Index: 1916-2005 Hounslow Vol. 5C Page 487). The Christmas family go back a long way. William John's father, Benjamin, married Eliza Nias on Christmas day 1887. There is some confusion about Eliza's birth. According to her marriage record she was 26 in 1887. Making her birth year 1861. A Charlotte Eliza Nias was born in Shepherds Bush January 19th 1861 and baptised at St. Stephen's February 15th 1861. This would match in with her wedding age but an Eliza Nias was born to the same parents April 5th 1863 and baptised, at the same place, February 15th 1863. The parents of both were Henry and Mary Nias. At the time of the baptisms the family were living at 8 Bannister Cottages. There were two more sisters, Anna born in Acton 15th March (baptised 18th March) 1856 and Harriett Mary born 30th April (baptised 22nd April) Shepherds Bush 1859. The family seem very elusive. Eliza is said to be living at 26 North Road at the time of her wedding but the 1881 census starts at 36 North Road and no record of Eliza Nias appears. Other than that I can only find an 1861 census when Henry, Mary, Hannah (Anna) aged 5, Mary A. (Harriett Mary) aged 2 and Charlotte aged 3 months were still living at 8 Bannister Cottages. Henry was a gardener and Mary worked in a laundry. At the time of the 1891 census Benjamin and Eliza were living at 24 Cressage Road with Mary (Harriett?) aged 2 and Julia aged 7 months. Before his marriage in 1887 the 1881 census shows Benjamin, aged 22, and his brother Richard, aged 24, were living with their sister Jane and her husband, Charles Sansom, at 52 North Road, Ealing. Benjamin, Richard and Charles were all occupied as lightermen. At the time of the 1871 census Benjamin, aged 12, was living with his father, another Benjamin aged 43 and his mother Julia, aged 43. Benjamin is occupied as a labourer. Also living there are one daughter, Jane aged 20, and a son Richard aged 15. Jane was occupied as a domestic servant. The family were living at 10 Brentford End & Brickfield Yard. Julia died in 1872 (see England and Wales, Death Index: 1837-1915 Brentford Vol. 3a Page 31) at the age of 43.The family had moved to Brentford from Watford as the 1861 census lists them as living in Watford Field. Benjamin is aged 33 and a "General Dealer Shop", Julia is 33 and Jane is 9. Another daughter, Julia is aged 7, Richard is 5 and Benjamin 2. Benjamin was married in 1848 (see England and Wales, Marriage Index: 1916-2005 Brentford Vol. 3 Page 25). His wife I believe to be Ann Julia Bolton as she appears on the same page of the Brentford records (see England and Wales, Marriage Index: 1916-2005 Brentford Vol. 3 Page 25). In 1851 they were living in the High Street, Ealing with niece Mary Ann Woodly and visitor Joseph Bolton. Joseph must have been Julia's brother as the 1841 census has them living in South Street Isleworth with William and Mary Fishlock ( their mother having remarried), their sister Ann Bolton, aged 15, brother Edward Bolton, aged 14, step-brothers William, aged 3, Thomas, aged 1 and step-sister Mary, aged 2. Benjamin (the elder)'s father was John Christmas. He married Louisa Young 8th January 1822 at All Saints, Isleworth. Benjamin was baptised in Christ Church, St. Mary- Le-Bone on the 25th May 1828. When Benjamin was baptised the family were living in Little George Street, Hampstead Road. John was a butcher and must have died quite young as by 1841 Louisa, aged 35, was a widow and living with Benjamin in South Street, Isleworth. Ten years later Louisa was living with her mother and father in South Street. Her father, Benjamin Young, was by then 81 and her mother, Elizabeth, 73. There is some discrepancy between the ages but I believe she was born in 1802. Benjamin is listed as a Tallow Chandler and Louisa as a Schoolmistress. Louisa died in 1868 (see England and Wales, Death Index: 1837-1915 Brentford Vol. 3a Page 24) aged 66. Returning to the Payne family the next born was John, he was born in 1902. (see England and Wales, Birth Index: 1837-1915 Brentford Vol. 3a Page 113). John married Louise Grant 29th February 1936. They lived at 39 Burford Road then moved to Hamilton Road where they lived for forty-four years. John was a lorry driver and worked for Ham Wharf. Louise was born in 1910 the youngest daughter of William and Charlotte Grant. The Grant family were long established in the Brentford area. Many of the male members of the family were called William, which can get quite confusing. Perhaps the easiest way is to number them, starting with William(1). William(1) was a fish dealer and married to Mary. There first son, William(2), was born 15th April 1838 and baptised in Chiswick 13th March 1838. In 1841 the family were living in Chiswick. William(1) is described as a fishmonger, he was 25. Mary was also 25. Their eldest child, Mary was 5, William(2) was 3 and James 1. In 1851 William(2) was living as a servant to a greengrocer at 1 Devonshire Street, Chiswick. William(2) married Martha Clements at the Parish Church, Ealing 20th August 1860. They were both resident in Old Brentford at the time. William(2) is described as a "Fishman" and Martha's father as a "Fruiterer". Before her marriage Martha was living with her parents, Stephen and Mary, in Back Lane, Ealing. The 1851 census records Stephen, 45, as a "Fruit and Fish Hawker". Mary was 36 and there were five children, Stephen 14, Mary 12, Martha 10, Elizabeth 6 and Thomas 2. This is where things don't quite match up. At the time of his marriage William(2) is described as a greengrocer as he is in the 1861 census. However the only baptism records I can find refer to him as a labourer. No other records seem to match so I have continued to assume they are the same person William(2) and Martha's first child, William(3) John was baptised in New Brentford 28th October 1860. William(2) is described as a "labourer". The 1861 census records William(2) aged 23, Martha 21 and William(3), aged 6 months, living at 9 Devonshire Place. The second child, Caroline, was born 18th March 1862 and baptised in Ealing 1st June 1862. Caroline died at only one year old. The death was registered at Brentford in the third quarter of 1863 (see England and Wales, Death Index: 1837-1915 Brentford Vol. 3a Page 61). A second son, James, was born about 1864. There is an index entry (see England and Wales, Birth Index: 1837-1915 Brentford Vol. 3a Page 65) but unlike the others I can find no baptism record. In 1866 a third son, Thomas, was born on 4th November and baptised at St. George, Old Brentford 25th November 1866. Thomas survived for only a few weeks. His death, aged 0, was registered at Brentford in the first quarter of 1867 (see England and Wales, Death Index: 1837-1915 Brentford Vol. 3a Page 47). Another son named Thomas Benjamin was born and baptised 15th December 1867. The Christian Name column was left blank on the baptism record and the occupation was given as "Fish-hawker". This was Martha's occupation and it maybe that William(2) was already ill as it looks as if he died in the third quarter of 1868 aged 30 (see England and Wales, Death Index: 1837- 1915 Brentford Vol. 3a Page 51). The 1871 census records Martha, aged 27, a widow living at Millaids? Cottages, Ealing. Her occupation is listed as a "Hawker" and living with her are James 6, Esther 5 and Emily only just born at 14 days old. The whereabouts of William(3) and Thomas is unknown but they may have been staying with relatives as Emily had just been born. There are some Birth Index entries relating to James, Esther and Emily but no baptism records, so it is impossible to say which are the correct entries. If William(2) died in 1868 then Emily could not have been his daughter. Martha went on to have two more children, William(4) born 20th August 1872 and Robert born 2nd February 1875. Baptism records exist for both these boys but only Martha's name appears on them. I have been unable to find the father, or fathers, of Emily, William(4) or Robert. William(4) was baptised at St. Pauls', Old Brentford 8th September 1872. Robert was baptised at the same place 6th March 1875. In 1881 Martha and all the boys were living in Back Lane Ealing. Martha is recorded as a "General Dealer" and is aged 38. The boys are recorded as William(3) 20, a "Basket Maker", James 17, Thomas 13, William(4) 7 and Robert 6. Esther would have been 15 and Emily 10. There is a record of an Esther Grant, aged 14, living as a domestic servant to George and Betsy Bates at 347 High Street, Ealing. George was a fishmonger which is a connection with the Grant family business. Emily died before her first birthday in the last quarter of 1871 (see England and Wales, Birth Index: 1837-1915 Brentford Vol. 3a Page 47). Esther (now Hester), aged 26 is still living at 347 High Street in 1891 but George Bates has been replaced by William Butcher, a "Fishmonger & Grocer". Hester is now recorded as a relative. Mother and daughter are now called Elizabeth instead of Betsy and Nelly is now Ellen. There are four Butcher girls, Mary 17, Eliza 14, Sarah 12, Harriet 10 and three Bates girls, Elizabeth 18, Ellen 12 and Mary 7. Hester's occupation is a "Laundress" as is that of Mary Butcher. Hester married Michael Casey at St. Paul's, Old Brentford 25th. February 1894. She is described as a spinster living in Back Lane. Esther may have given James Grant's address as he was living at 2 Back Lane in 1891. James was the first of the boys to marry. He married Agnes Harvey at St. Paul's, Brentford on 25 December 1883. James and Agnes were both living in Paradise Place, Albany Road at the time of the marriage. James' occupation was recorded as a "Labourer". By 1891 James 27 and Agnes 27 had moved to 2 Back Lane and had two daughters, Ellen aged 3 and Hester, who was 5 months old. James was a "Dock Labourer". The family were living at 11 Back Lane in 1901 and the family had grown to include two sons and another daughter. Ellen was now known as Nellie and Hester as Esther. The first son, Jim, was 8, the second son, Tom 5 and the third daughter, Agnes 3. James was still working as a dock labourer, his wife as a "Laundry woman". The second to get married was William(3). He married Mary Ann Barratt at St. Lawrence, New Brentford on 6 June 1885. Before his marriage William(3) was living with Martha in Back Lane. After their marriage William(3) and Mary moved to the Recreation Ground, 3 Proctor's Cottages. By 1891 they had three daughters, Mary aged 6, Ellen 4, Anne 1 and a son James 2. Both William and Mary were described as "Punnet Makers". William(3)'s daughter Ellen married Venus Wakeman 2 April 1908. Ellen was living at 34 Albany Road at the time. The P.O. Directory 1938 records a Sylvanus Wakeman, a greengrocer, living at 121 Devonshire Place, Chiswick. Venus Wakeman's father, William, spent some time in Australia and Venus' sister, Sarah, was born there. Williams family had previously lived at various addresses in Chiswick, 11 James Street in 1851 and 19 Wood Street in 1861. William was living alone at 7 William Street in 1871 and married Ellen Oxley 20 January 1873. By 1901 William was widowed and back in this country, living with Venus aged 15, Sarah 14 and James 13 at 45 William Street. It is interesting to see how close the related families lived to each other in. Venus Wakeman married Ellen Grant whose cousin was Louise Grant who married John Payne. John's father William Payne married Bridget Hemmings whose father, Luke Hemmings married Ellen Dalton. The Grants were all based around Albany Road, Brentford and the other families in a small are of Chiswick. Some mention has already been made to the Chiswick area in relation to William Payne and maps add a little more detail. The area where most of the families lived was called "Chiswick New Town" and was built 1821 and 1831. Some old photographs show what some of the houses looked like although the building was not uniform. However most of them were terraced and certainly very small. The censuses show that two families often shared one house with as many as ten adults and children in what was basically a "two up and two down" house. The Grant family were well established in the Albany Road, Back Lane area. Kelly's directory 1914 places them at mostly the eastern end of the south side. 5 " " William(3) 1891? The records can be confusing as some censuses give the birthplace as "Ealing" whilst others, for the same person, give it as "Brentford". Until 1928 the eastern part of the High Street area ( Old Brentford) was in the parish of St. Mary, Ealing. After 1928, when St. George's opened it became part of that parish. In 1868 the western end of St. George's became St. Paul's parish. Further west (New Brentford) was the parish of St. Lawrence. Returning to William(3) Grant, by 1901 the family had moved to 5 Sussex Place, Albany Road. Mary, 17, was still living at home and was employed as a "Laundry hand", James was now 13. Ellen was living with Martha at 7 Wellington Place, Albany Road. There is no record of Anne but there is an entry of a death of a Mary Ann Grant in Islington, died third quarter 1892 aged 1 (see England and Wales, Death Index: 1837-1915 Islington Vol. 16 Page 167). Three more daughters had been added to the family, Catherine, 8, Rosina, 4 and May, 2. There was also another son, Thomas, aged 6. Thomas was the next son to marry. He married Sarah Ann West 25 December 1889 at St. Paul's, Old Brentford. Both were resident in Albany Road at the time of the marriage. In 1891, two years after their marriage, Thomas and Sarah were living at 8 Barracks, Albany Road. Thomas was listed as a "Costermonger" and Sarah a "Garden Woman". By 1901 The family had moved to 3 Rose Cottage, Albany Road. Thomas was now a "Fishmonger". There were now three children, Thomas, aged 9, Louisa 6 and Sarah 4. Next to marry was William(4). He married Charlotte Allen 25 December 1892 at St. Paul's, Old Brentford. At the time of the 1901 census they were living at 3 Burdett's Row, Albany Road. William was 30 and a "Gas Labourer", Charlotte was 28 and a "Laundress". They have two daughters, Daisy, aged 6, Ellen 1, and two sons, William(5), aged 8 and Robert 4. The family moved twice before the 1911 census, from 3 Burdett's Row to 65 Albany Road in about 1889/1901 and from there to 63 Albany Road in 1907/ 1908. William(4)was now a "Fish Hawker". William(5) had left home and Robert was at school. Daisy, now listed as "Cissie" was working as a packer in a factory and Ellen was now listed as "Nellie". Four more girls had been born, Sarah, aged 6, Maisie 7, Ada 4 and Louise 1. It was Louise who later married John Payne. William(5) joined the Territorial Army in 1909. He was a parchment maker at H. Banks & Co.
William(5) may have made the army his career as that was his occupation at the time of his marriage to Annie Grant. Annie was his cousin although their fathers, William(3) and William(4), did not have the same father. Both fathers were fishmongers. Sandra remembers William and Charlotte's little cottage on Albany Road. It was situated on the corner of Kings Arms Alley, which she called "Gran's Alley". There is a block of flats there now called Berkeley House. William and Charlotte's cottage was on the corner and the back gate was along the alley. William and Charlotte's daughter, Sarah, lived all her life on Albany Road, first at number 45 then, in later years, she moved into Berkeley House. Louise Grant and John Payne were married at St. Paul's, Brentford, they had two daughters. Sheila Helen was born 12 April 1942 (see England and Wales, Birth Index: 1916-2005 Brentford Vol. 3a Page 528) but sadly died 17 August 1947 (see England and Wales, Death Index: 1916-2005 Brentford Vol. 3a Page 528). Sandra was born in 1947 (see England and Wales, Birth Index: 1916-2005 Brentford Vol. 5e Page 471). Sandra remembers living in Hamilton Road. "When I was young we had an attic which contained lots of oil paintings. I was told that when Bridget, my grandmother, lived by the canal Dutch sailors used to bring ammunition up during the night. Bridget used to put them up for the night and in return they gave her these paintings. We had them right up until the 1960's". The last of the Grant's to marry was Robert. He married Mary Ann Earle at St. Paul's Brentford 23 June 1895. Robert was living at 11 Mount Pleasant, Albany Road. His father was given as Robert Grant which may be an error for William Grant (deceased). Ellen Bates is mentioned, I wonder if that was the Ellen Bates where Esther was living in 1891? In 1901 Robert and Mary Ann were living at 35 Kenley Road Brentford. Robert was a "Timber Labourer" and they had a son Robert, aged 5, and a daughter, Ellen 7 months old. Mary Ann must have died during the next decade as Robert married again. He married Queenie Gibbons 24th March 1912 at St. Georges, Old Brentford. Robert is described as a widower still living at 35 Kenley Road. His father's name is now given as William which confirms the mistake on his first marriage certificate. Queenie was living at 26 Kenley Road and a spinster. Her father was William Gibbons, a waterman. The last part will have to be about Martha. Although there must be stories about her grandchildren they will have to wait. At the time of the 1891 census Martha's father was living with her at 7 Proctors Cottages. In 1901 Martha was living at 7 Wellington Place, Albany Road. Living with her was her grand-daughter Ellen, the daughter of William(3). Martha was 58 and and working from home as a "Punnett Maker" Ellen was 14. Martha died in the first quarter of 1911 aged 66 (see England and Wales, Death Index: 1837-1915 Brentford Vol. 3a Page 40). She must have seen great changes in those sixty-six years and probably led quite a hard life. See also Sandra Graves' summary of the Grant and Payne families and Bob's details of earlier generations of the Payne family.